Itanagar, April 10: Voting for two Lok Sabha constituencies and 60 Assembly seats in Arunachal Pradesh has ended. The state went for elections in the first phase. The two Lok Sabha constituencies on which polling took place today were Arunachal East and Arunachal West. Till 5 pm, 58.26 percent voter turnout was recorded in the state. Meanwhile, At least three persons were seriously injured in a clash between supporters of two rival political parties under Tali assembly constituency in Arunachal Pradesh's Kurung Kumey district during polling. Chief Minister Prema Khandu cast his vote at a polling station at Government Higher Secondary School at Momba in Tawang district, bordering China. There were reports of EVMs developing technical snags from several districts but the election authorities replaced the machines immediately and voting was not disturbed, Deputy Chief Electoral Officer Liken Koyu said. Indian Army Personnel Deployed in Remotes Areas Along China And Myanmar Border Cast Votes For First Phase of Lok Sabha Elections 2019. There are a total of 301,173 electorates out of which 147,025 are females and 154,148 are males in Arunachal East. 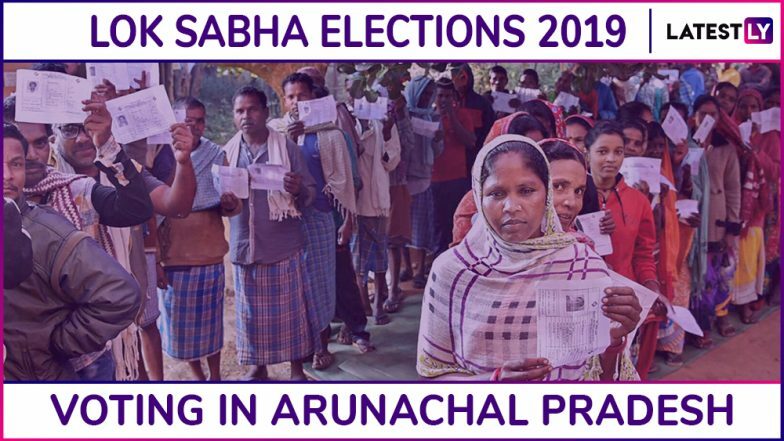 Meanwhile, The Arunachal West Lok Sabha Constituency (constituency number 1) consists of 433,368 number of electorates in totality, of these 215,516 are males and 217,852 are females. How To Vote in India? Use of EVM and How to Verify in VVPAT? Tutorial On Casting Vote During 2019 Lok Sabha Elections. Voting took place through Electronic Voting Machines and VVPAT machines have also been placed at every polling booth. Seven Candidates are contesting from Arunachal West. Key candidates contesting from here are -Union Minister Kiren Rijijiu, Nabam Tuki of Congress and Jarjum Ete of Janata Dal (Secular). Meanwhile, there are five candidates in fray from Arunachal East. Key candidates contesting from this constituency are - Lowangcha Wanglat of the Congress, Tapir Gao of the Bharatiya Janata Party (BJP) and Bandey Mili of the Janata Dal (Secular). Lok Sabha Elections 2019 Constituency-Wise Schedule. The state is also going for polls for 60 assembly seats. There 33 assembly seats in Arunachal West Lok Sabha Constituency and 27 assembly seats in Arunachal East parliamentary constituency. There are 2,202 polling booths are set up across the state for the assembly elections. Meanwhile, on three seats BJP candidates elected unopposed. The winners are Kento Jini from Along East constituency in West Siang district, Taba Tedir from Yachuli seat in Lower Subansiri district and Phurpa Tsering from Dirang seat in West Kameng district. After the assembly elections of 2014, the Congress won 44 seats out of 60. Khandu took the oath as the chief minister of Arunachal Pradesh on 17 July 2016 following a year-long political crisis. How to Check Your Name In Voter List? Download Voter ID and Slip Ahead Of Phase I Lok Sabha Elections 2019.On 16 September 2016, Khandu and 42 other MLAs from the ruling party, defected from Indian National Congress to People's Party of Arunachal (PPA), an ally of the BJP. The only Congress MLA who did not defect was former Chief Minister Nabam Tuki. However, in December 2016, the CM along with six MLA's was suspended from the PPA. Few Days after, Khandu proved majority on the floor of the house with 33 of the PPA's legislatures joined the BJP. Now, the saffron party has 45 legislatures in the assembly including two independents. Which Lok Sabha Elections 2019 Constituencies Will Go To Polls in Phase I? List of States and Names of Seats to Vote on April 11. The Election Commission of India, on March 10, had announced the schedule for the Lok Sabha Elections 2019. The general elections will be held in seven phases. The voting in the first phase voting has begun today, i.e. April 11, while the last round of polls will take place on May 19. The results of the same will be announced on May 23. Along with the Lok Sabha polls, voting will also take place for four assembly elections in Odisha, Sikkim, Andhra Pradesh and Arunachal Pradesh. The Arunachal Pradesh Legislative Assembly election, 2014 took place on 9 April 2014 along with parliamentary election 2014. The Congress had won 44 seats. Khandu took the oath as the chief minister of the state on July 17, 2016, following a year-long political crisis. On September 16, 2016, Khandu along with 42 MLAs defected from the Congress to People's Party of Arunachal Pradesh (PPA), an ally of the BJP. However, on December 21, 2016, Khandu along with six other MLAs were suspended from the PPA by the party president and Takam Pario was named as the next likely Chief Minister of Arunachal Pradesh. A few days later, Khandu proved majority on the floor of the house with 33 of the PPA and joined the BJP. The saffron increased its strength to 45 with support of two independents.